I expect my phone to access the internet, read PDF documents, show me a map of the local area, and count how many steps I walk, but I have no need to use it as a compass, calculator or spirit level, even though I could. In fact, I take some pleasure in having a small pocket calculator in my bag – I can only ask one job of it, but it does that job perfectly. Likewise, I write my articles using a word processor, not a computer. The AlphaSmart Neo word processor was made from 2004 to 2013, the latest in a line of machines begun in 1993, from a company set up by two former Apple Computer employees. AlphaSmart’s intention was to create an affordable device for learning in classrooms, as multiple processors could be connected for tasks and lessons – the final processor in the line, the Neo 2, could also run class quizzes. 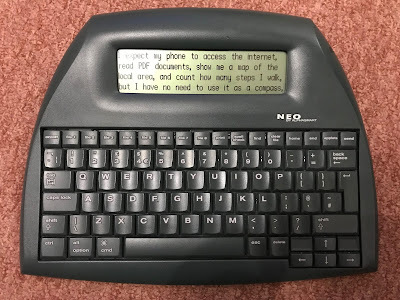 However, its main function is as a digital typewriter, small and light enough to carry anywhere, but with a full-sized keyboard, for the simple entry of text onto a LCD screen, automatically saved to be uploaded via USB cable to your main computer later. 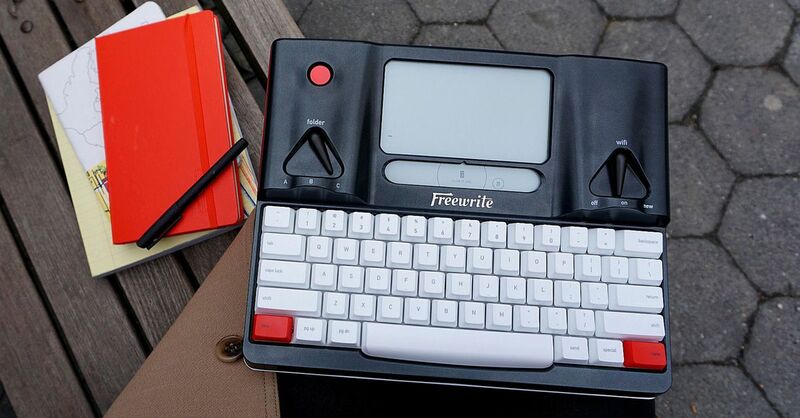 With no wi-fi, cloud computing or internet to worry about, three AA batteries will last for up to SEVEN HUNDRED HOURS of continuous typing. I bought my AlphaSmart Neo for £20 on eBay four months ago, and I am still using the original batteries. It is ready to type within three seconds of turning it on, more immediate for entering an idle thought than finding a pen and paper - because I only use the word processing program, the machine will always boot into a cursor flashing ready, provided you remember which of the eight available files you selected last time. Total memory is only 512K, or 0.0005Gb, but that is enough for two hundred A4 pages. You can change the size of the text on screen, but you cannot make it bold, italic or underlined, as you do that when you upload your work later. I can simply connect a USB cable to my main computer, open a word processing program, press “Send,” and my text flies onto the screen, like it is being typed especially quickly – watching the screen fill up with your first draft is very satisfying. The decline of the AlphaSmart corresponded with the rise of far more flexible tablet computers, and the general reduction in the cost of computing. I have a Bluetooth computer for my iPad, and have written articles on it before, but I personally find it far too easy to flick between apps to find information from a website, only to return to my word processing app after an hour or so has passed. To have a machine that requires you to concentrate, and to keep typing until the job is done, is useful enough, but it requires the maker to forego building a device that can anticipate and accommodate possible future uses. If you don’t need that, it doesn’t matter. 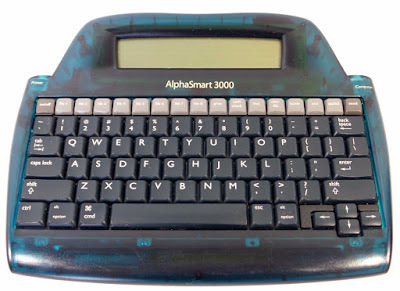 I think there could still be a market for the AlphaSmart, at least in the way I use mine. A recent Kickstarter project was the Hemingwrite, later renamed the Freewrite, essentially a typewriter with an aluminium body, e-ink display, rechargeable battery, wi-fi cloud support and a carry handle, but costing around £400 – the “set your writing free” philosophy of its manufacturer, Astrohaus, is pitched more towards creative writing than to work. What would I do? Take a one-chip microcontroller device, like a Raspberry Pi, load a simple word processor program to it, attach an e-ink or LCD screen, add a keyboard, battery and USB port, put it all into a box the size of a small book, and sell it for about £60. I nearly made one myself, until I found that AlphaSmart made the perfect device years ago.